good morning. we lost a chicken yesterday. a hawk made it past my fish line barrier (hawks have extremely keen eyesight and they see the fishline and won't fly into it) and got one of the bielefelder hens. so last night when rob got home we stretched shade cloth over the whole enclosure. the hawk could still fly into it, but the result would be not a good one for it. hopefully this will fix the problem once and for all. we will have to revisit this and brace it better before it snows, but for the moment, it will hold and protect the hens. very thankful I still had a piece of shade cloth big enough. and I spent part of yesterday putting seat covers on the van. since we got the Subaru, I decided I wanted to upgrade the van a little. it's our dog and crap hauling vehicle, so it's pretty messy. we cleaned it up, took it to the carwash, put new carpet in the back where the dogs ride, and I got a steering wheel cover on clearance and some very cute seat covers from a place in CA that custom makes to order. they are tan with doggie footprints on them. well made and nice. the passenger seat went on fairly easily--drivers side was more complicated and involved some struggling. today I have a stiff shoulder and VERY tired hands to show for it. but they look very nice and i'm quite happy with them. still to come are all weather floor mats. unloaded the kiln yesterday afternoon. I had slightly changed the firing schedule and made a few changes based on the first firing, and was overall happy with what I learned. the main thing is that I am going to concentrate on this speckled clay. it seems to be very forgiving and takes glazes quite well, and I like the look a lot. here is a pic of some of the better results of these two sessions. 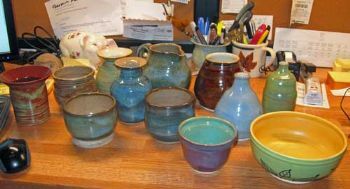 I have learned a lot in this process--and have found a few glaze combinations I really like. and I have gained a lot of knowledge about the firing schedule too. still not there yet, but farther along. time to get to the park. have a great day! Poor chicken! At least it was just one!! I am loving all of the different pieces I'm seeing!! It's exciting! Beautiful work! Glad to hear your car got spiffyed up. Poor Chicken. Things happen. Hopefully your new measures will help. I just love this glaze. I also love the bowl with the yellow center and I like those smaller bowls. Very functional stuff which is how I like my pottery. We have a dog and crap car too though now Charlie is having trouble getting in that car. Might have to see how mine works for him. Sounds like you had a busy day yesterday, have a relaxing weekend! AHHH I LOVE that big bowl with the yellowish center. What is the work near the bottom? Leaves? You are getting quite good.